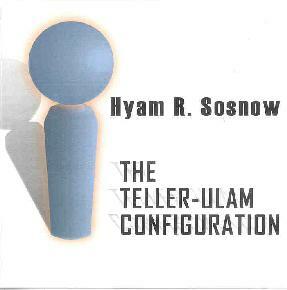 Hyam R. Sosnow - "The Teller-Ulam Configuration"
Hyam R. Sosnow first came to my attention as the drummer in the improvisational rock duo Jugalbandi, the other half being guitarist Greg Segal. The Teller-Ulam Configuration is a set of solo drum improvisations which state Hyam's case that the drumset is a musical instrument, capable of as much melodic, harmonic and textural shading as any ‘conventional' instrument (quoting from liner notes). Even before playing the CD I suspected that Hyam would convincingly support his argument, given how successful Jugalbandi has been in creating exciting rock music with only guitar and drums over several releases without the benefit of what is usually a much needed bass player. So how does 60 minutes of solo drumming hold up? Surprisingly well, depending on how the listener approaches it. In many ways hearing Jugalbandi is to hear Hyam as a solo artist. Without the bass, the guitar and drums each stand front and center as individual players. Listening to this set of 17 solo pieces does indeed showcase the drumset as a musical instrument. Hyam's immaculately tuned kit succeeds in creating rhythmic "songs" that have a vocal quality while making the toes want to tap. And the mix is a critical factor, each beat strategically placed to the left, right, middle or sweeping right through the ears. Some tracks have an orchestral quality, a highlight in this regard being "Captain Nagano's Secret", a highly expressive and often intense piece. Track-by-track liner notes always make the Jugalbandi experience a richer one, and Hyam is equally generous in sharing the background details for each track (available at the Jugalbandi web site). Many argue that music should stand on it's own merits without polluting the listeners senses with explanations. But I think background notes make for a much more personal listening experience and give what for me is welcome insight into the artist. So while an entire set of solo drumming is clearly not for everyone, Jugalbandi fans will surely enjoy Hyam's work, as will anyone with an appreciation for the contributions of the skin basher. Contact via snail mail c/o Great Artiste 89 Records; P.O. Box 55843; Sherman Oaks, CA 91413-0843.